Quick and Precise in troubleshooting! Problem solved in under 2 minutes! Anthony V came to fix a technical issue with my security system. Within two minutes of entering my house he had diagnosed the problem and proceeded to take correctiv measures, which were completed in under an hour. I found him to be a very personable and informed person with good communication skills and knowledge of the equipment he was servicing. He even took the time to replace the window decals he noticed that were peeling off and faded. Extremely pleased with this service call. Thank You for having people like this on your staff. One happy customer Michael Miller. After many visits by techs, Mark Finally came through and resolved the issue. Very professional during the visit. Thorough in troubleshooting, diagnosting the defect and repairing in a timely manner. Joel was my technician, he came out today to fix my motion detector, super sweet guy, he actually was my technician a few years ago also, very friendly and was quick to fix the problem with my alarm! Can't say enough about how quick and efficient Joe and Ryan were while they installed my new doorbell. They even made friends with my chihuahuas! I would highly recommend SafeTouch and would have given them ten stars if I could. 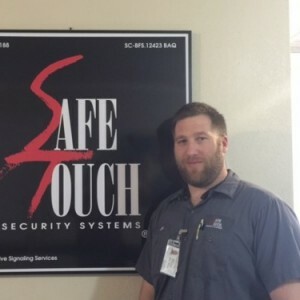 Thanks, SafeTouch!!! Technician was prompt, courteous, and efficient. Took time to explain installation locations and options. Very professional and through. Hosner was very nice and professional. He was very thorough and educated me on how to use the system, walking me through every feature of the mobile app. Job well done! He did a great job. It would be wonderful if he came back when I need another service. He made sure everything was working before he left. safe touch is a very conscientious company, Been with this co. since I got my new house 18 years ago. Could not have been a better service call. Joe went above and beyond to make sure my system was working correctly. Joe was great! I wish other companies would train their people with the knowledge and professionalism that Joe has. We love how customer service oriented SAFE TOUCH is....I wish COMCAST could take some lessons from you guys !! *** was a very respectful person. He made sure everything was working before he left. In addition, he took initiative and changed the SafeTouch sign in my front yard. It would be a pleasure if he came back when I need another service! The Technician, Joe E. Was awesome. He has been so helpful with all my queries. And has done a great job in fixing our system. Very nice man. He answered all questions completely. Very good representative for Safe Touch. I wish all service people were this professional. Good job. Had to wait on hold way too long the first time I called. I was "next in line" for around 15 minutes. It was much better the second time. Joe was very good at what he dod at our home.all was great. Thank you. *** was extremely thorough and polite. He explained everything he did and spent time to be sure everything was working correctly. Not sure why I keep having sensor issues. The last tech informed me that they're some issues. I don't believe I should have to call every time I have issues. I wish all of them could just be replaced. Joe E. was very professional and courteous while in my home. Tech changed all batteries which tech's hardly ever offer to do. Think that is always needed and appreciated esp. When a tech has not been out in awhile. Very professional and solved our problems with the system. Joe E., the tech, was the best ever!!! He changed the batteries on all of our long installed contacts and on the main box, and checked everything else in our system to make sure it was working like new. What awesome service!!! Thank you, Joe E. and Safe Touch! *** *. did a great job troubleshooting our alarm system and repairing it within 20 minutes. He showed us how to access portions of our system that we had previously not been able to use and even checked some of our devices to make sure all were in good operating condition. Scheduling the service appointment was quick and easy and *** arrived right on time.